When you seek to live a spiritual life, what matters most is not what you know, but the actions you take. How do you best embody the spiritual principles that uplift you and those whose lives you touch? On Insight Meditation, you will learn one of the world's great contemplative practices, as it was taught by the Buddha himself and then passed friend to friend for more than 2,600 years. 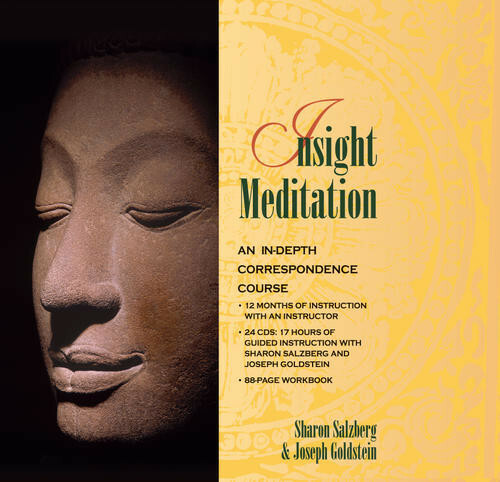 Based on the curriculum developed at the Insight Meditation Society's retreat center in Barre, Massachusetts, this audio correspondence course is presented by IMS cofounders Sharon Salzberg and Joseph Goldstein, who are among the West's most respected meditation teachers. As each lesson unfolds and the principles of mindful living are revealed, students learn to see past the illusion of life's obstacles and move toward an awakened mind state—the true freedom we seek to achieve. Now you can experience this rich and sacred retreat environment in your own home, with these same masterful instructors. Students will learn with a qualified meditation instructor how to establish and sustain a daily meditation practice. You will also receive a complete 88-page workbook created expressly for the Insight Meditation course. Organized to accompany the audio curriculum, your workbook features exercises that you complete and return to your insight meditation instructor. Easy to follow and a pleasure to learn from, this unique resource is not available anywhere else. Lesson 1: The insight tradition; how happiness arises; the power of mindfulness; the five precepts for ethical living; six aspects of correct posture; eight breathing exercises. Lesson 2: Bare attention and awareness in the present moment; working with thoughts during practice; traditional walking meditation, or mindfulness in motion; seven walking meditations. Lesson 3: The five hindrances to mindfulness; understanding attachment to desire and aversion; working with pain. Lesson 4: Working with sleepiness, restlessness, and doubt; the antidotes to the hindrances; Mara, the tempter; four exercises for working with hindrances. Lesson 5: Concepts and reality; myths of time, place, and self; six exercises for mindful eating; the roots of mind; wrong view. Lesson 6: The truth of suffering; painful experience, change, and conditionality; seven exercises for working with emotional states; the Four Noble Truths. Lesson 7: How we create delusion; wise attention and freedom from delusion; clear seeing; working with thoughts and images; exercises for recognizing delusion. Lesson 8: The awakened mind; karma defined; intention and action; self and karma; the Four Heavenly Abodes; the Six Realms of Existence; seven exercises for working with intention. Lesson 9: Equanimity as a spiritual force; conditioning, pleasure, and pain; the Eight Vicissitudes; the Six Sense Doors; eight exercises for working with pleasant and unpleasant feelings. Lesson 10: Saddha; the nature of faith and wisdom; the five spiritual powers; testing faith yourself; Big Mind exercise. Lesson 11: Metta, or loving-kindness; distortion of self and other ; strength without anger; benefits of loving-kindness; eight metta exercises. Lesson 12: Bringing meditative awareness into your everyday life; lessons of daily sitting; the three fields of training; eight exercises for taking practice to the world. An excellent overview of Insight (or 'Vipassana') meditation. I've loved this one for many years now. I've listened to it repeatedly and I gleen something new from it each time I listen. The stories related in it stick with me to remind me about how our conduct in daily life can be easier, more loving, more giving and more compassionate. And how we can create this by related differently to our thoughts, our emotions and others in life.